CICH graphic created using data adapted from Canadian Mortgage and Housing Corporation. (CMHC) Canadian Housing Observer. 2014. https://www.cmhc-schl.gc.ca/odpub/pdf/68189.pdf accessed March 20, 2017. 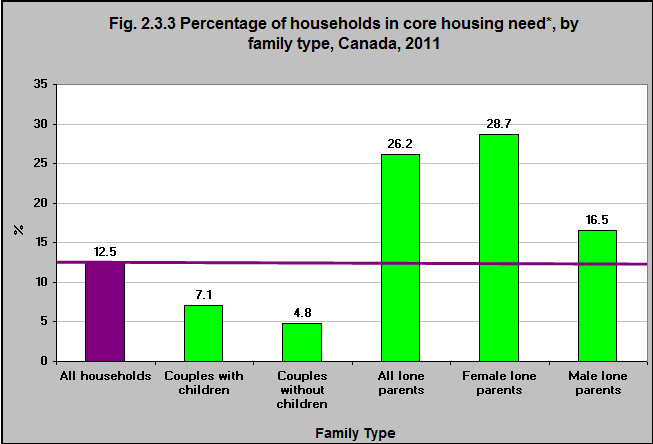 In 2011, families with children were more likely to be in core housing need than were families without children. Only 4.8% of couples without children were in core housing need compared with 7.1% of couples with children. However, lone parents were by far the most likely to be living in core housing need. The rate of core housing need for all lone parents – 26.2% – was more than twice the national average. The rate of core housing need among female lone parents was almost twice that of male lone parents. 1Bryant T. 2004. Housing and health. In D. Raphael’s Social Determinants of Health: Canadian Perspectives. Toronto: Canadian Scholars’ Press. https://www.canadianscholars.ca/books/social-determinants-of-health-3rd-edition#tab_toc – accessed June 15, 2017.